Woohooligan! Secret Lives of Klingons! This is the first in a short series of comics detailing the life of your average Klingon, from cradle to grave. Hopefully you'll enjoy these even if you're not necessarily a Star Trek fan. I'm not sure exactly how many of these there will be. I've got scripts for about a half-dozen. You perform a great service with this, Sir. If we could only understand the Romulons as well. As long as it's deliberate. - You see, I knit, and that banner ad with "pearl two" in it was driving me nuts (for those who don't knit, it's spelled 'purl', though the ribbing produced by 'knit two, purl two' is generally accepted as a better product). uh, what? - The link "Check out the alternate ending here" took me to a verification page ("Since you're not a member, vote for the name of the character"). When I did that, it took me to a page with a comic about fetishes. 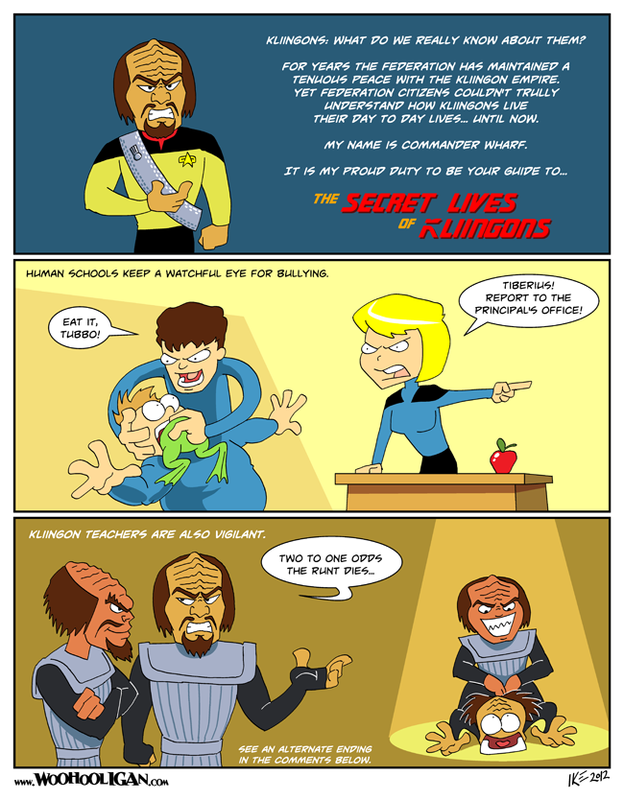 I'm not complaining about that, but I'm pretty sure it isn't an alternate ending to this Klingon bullying strip. Well you're voting for the comic, not "for the name of the character" -- entering the character's name is a CAPTCHA that Top Web Comics uses to prevent people from using anonymous robots to upvote their own comics. It does however say at the top of the page "Ahoy, hooligan! Thank you for your support! Vote below to see the Fetish Forum (9) alternate ending!" So you're informed right there that you're not going to see the Klingons alt ending, because it's moved on now to the Fetish Forum ending. Top Web Comics only allows one incentive at a time (unfortunately), and I don't have the time to go back and remove the alt-ending links from all my previous comics. If you follow the comic regularly, however, you can see all the new alt-endings as they're posted. ...you misspel "Klingon" every time, with two i's. Also it's Commander Worf, not Wharf. Aaaaaaand after reading the blurb I now feel stupid. Time to pchoo away from this universe. Death to Nazis! - Wait...am I allowed to say that? Major Strasser isn't around, is he?